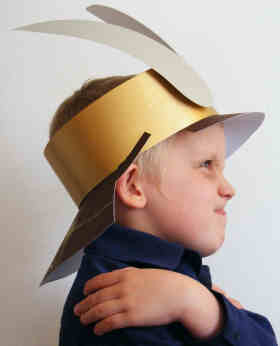 Cut a band of gold card 10cm wide and long enough to fit around your child's head. Tape the band into a circle. Mark on the band where you want your neck protector to go. Take off the band and put it on the brown card. Draw around the band between the points marked. Decorate with gold pen to look like basket weave, and cut out. Tape the flaps to the inside of the band. Now put on the band and mark where you want your visor to go. Take off the band and put it on the brown card. Draw around the band between the points marked. Using this line as your guide draw an arch about 5cm wide. 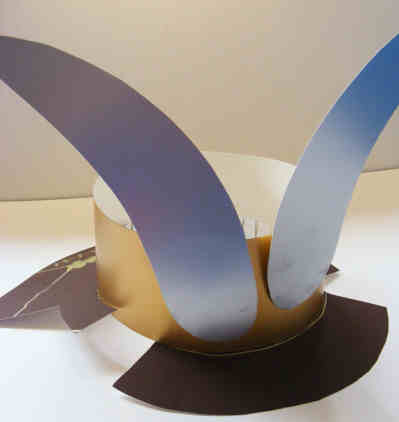 Draw flaps to attach the arch to the band, as before. 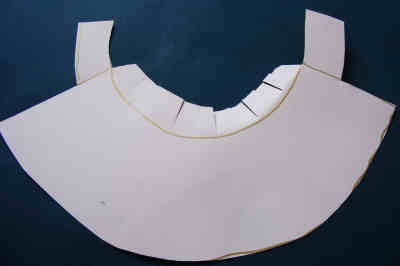 Cut the whole shape out and attach to the inside of the band. The attached arch can be seen at the bottom front of the photo below. Cut two horns from the silver card. Glue these to the front of your band. Idea: If you wanted to make your helmet longer lasting, instead of a card band you could make a helmet shape with a balloon and paper mache. Don't forget to make a Samurai sword to match!